Contrary to rampant speculation, the United States military's secretive X-37B space plane is most likely not spying on a prototype Chinese space module, experts say. According to a recent report by the BBC, a new article in Spaceflight Magazine suggests that the robotic X-37B space plane might be surveilling China's recently launched space laboratory Tiangong 1. As evidence, the article notes apparently striking similarities in the orbits of the two spacecraft. But in reality, these orbits are quite different, other analysts contend, making it extremely unlikely that the X-37B is keeping an eye on Tiangong 1. "I would go as far as to say, 'no chance,'" said Brian Weeden, a technical adviser with the Secure World Foundation and a former orbital analyst with the U.S. Air Force. "It's not practical." Diagram of the orbits of the X-37B space plane (red line) and China's Tiangong 1 space module (green line), as of early January 2012. The orbit for Tiangong 1 was pulled from the U.S. military's Space Track website, and the orbit for X-37B is from amateur observations. China's space agency launched its unmanned Tiangong 1 space lab in September and is using the vessel to carry out orbital docking tests, which are considered key to the nation's goal of building a manned space station by 2020. The Air Force doesn't make details of the X-37B's orbit or mission public, but amateur astronomers have been keeping a close eye on the space plane's movements. These and other observations have shown that the X-37B and Tiangong 1 have broadly similar orbits. Both are currently about 180 miles (300 kilometers) above our planet, with an inclination of roughly 43 degrees with respect to the equator (meaning their orbits range from 43 degrees south latitude to 43 degrees north latitude). However, the orbits of the X-37B and Tiangong 1 differ greatly — by about 100 degrees — in a parameter called right ascension, which describes where a craft crosses the equator, Weeden said. So the two satellites actually take disparate paths around the globe, with their orbits intersecting just twice per circuit. That means that the X-37B and Tiangong 1 could theoretically approach each other a maximum of two times per orbit, if the timing works out perfectly. And even then, they'd scream past each other at very high speeds — not exactly optimum conditions for a spy mission. Weeden compared the satellites' motions to two cars on separate roads that intersect at two different points. "And there's no stoplight," he told SPACE.com. "You're just blowing through the intersection at 7 kilometers a second." Another analyst contacted by SPACE.com echoed Weeden's reasoning, saying the two vehicles' orbits do not support the assertion that the X-37B is spying on Tiangong 1. While the United States may well be interested in Tiangong 1, the government has better information-gathering tools at its disposal than the X-37B for the job, Weeden added. "The U.S. has this whole network of ground-based telescopes and radars, several of which can do imaging — either radar or optical imaging of space objects — that are better suited for this," he said. What's the X-37B doing up there? So if the X-37B isn't keeping tabs on Tiangong 1, what is it up to? The Air Force has said repeatedly that the space plane's primary mission is to test out new technologies. Weeden, who published a report in 2010 that investigated the X-37B and its likely missions, thinks this rather vague description is probably accurate. He reckons the X-37B is likely trying out some new spy gear, perhaps instruments optimized to observe in wavelengths outside of the visible-light spectrum. The space plane's orbit also offers some possible clues about its activities. Rather than looping around the Earth in a polar orbit, which enables a good look at every spot on the globe, the X-37B is flying repeatedly over the stretch from 43 degrees north latitude to 43 degrees south. "It's probably using that new technology to observe the Middle East and Afghanistan — those are the places," Weeden said. 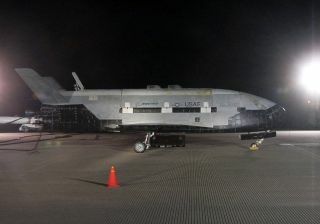 The Air Force has said the X-37B was designed for space missions lasting a maximum of 270 days. The first X-37B flight launched in April 2010 and landed that December, coming in under the nine-month limit. However, the current mission has been aloft for more than 10 months, so the military may be putting the vehicle through something of an endurance test. "I think that they are looking to push the second one," Weeden said. "Because it is an experimental vehicle, they kind of want to see what its limits are."